Feedback We heard from you… We always welcome comments and feedback from past issues. 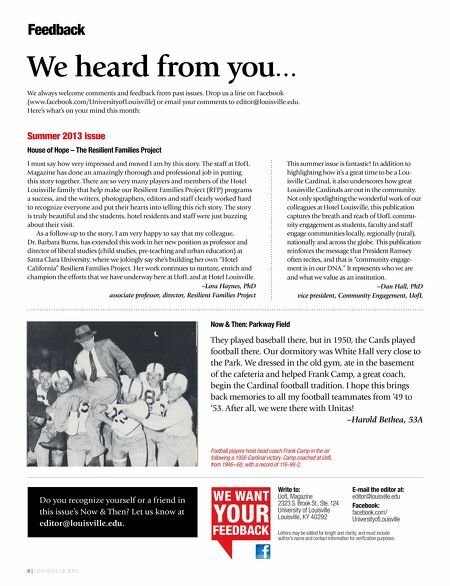 Drop us a line on Facebook (www.facebook.com/UniversityofLouisville) or email your comments to editor@louisville.edu. Here's what's on your mind this month: Summer 2013 issue House of Hope – The Resilient Families Project I must say how very impressed and moved I am by this story. The staff at UofL Magazine has done an amazingly thorough and professional job in putting this story together. There are so very many players and members of the Hotel Louisville family that help make our Resilient Families Project (RFP) programs a success, and the writers, photographers, editors and staff clearly worked hard to recognize everyone and put their hearts into telling this rich story. 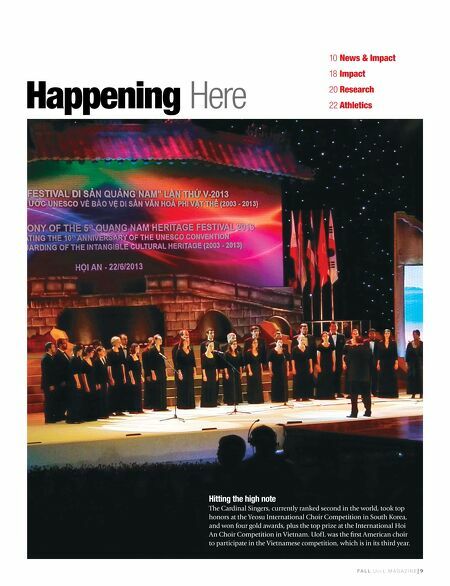 The story is truly beautiful and the students, hotel residents and staff were just buzzing about their visit. As a follow-up to the story, I am very happy to say that my colleague, Dr. Barbara Burns, has extended this work in her new position as professor and director of liberal studies (child studies, pre-teaching and urban education) at Santa Clara University, where we jokingly say she's building her own "Hotel California" Resilient Families Project. Her work continues to nurture, enrich and champion the efforts that we have underway here at UofL and at Hotel Louisville. –Lora Haynes, PhD associate professor, director, Resilient Families Project This summer issue is fantastic! In addition to highlighting how it's a great time to be a Louisville Cardinal, it also underscores how great Louisville Cardinals are out in the community. Not only spotlighting the wonderful work of our colleagues at Hotel Louisville, this publication captures the breath and reach of UofL community engagement as students, faculty and staff engage communities locally, regionally (rural), nationally and across the globe. This publication reinforces the message that President Ramsey often recites, and that is "community engagement is in our DNA." It represents who we are and what we value as an institution. –Dan Hall, PhD vice president, Community Engagement, UofL Now & Then: Parkway Field They played baseball there, but in 1950, the Cards played football there. Our dormitory was White Hall very close to the Park. We dressed in the old gym, ate in the basement of the cafeteria and helped Frank Camp, a great coach, begin the Cardinal football tradition. I hope this brings back memories to all my football teammates from '49 to '53. After all, we were there with Unitas! –Harold Bethea, 53A Football players hoist head coach Frank Camp in the air following a 1956 Cardinal victory. Camp coached at UofL from 1946–68, with a record of 116-98-2. Do you recognize yourself or a friend in this issue's Now & Then? Let us know at editor@louisville.edu. 8|LOUISVILLE.EDU WE WANT YOUR FEEDBACK Write to: UofL Magazine 2323 S. Brook St., Ste. 124 University of Louisville Louisville, KY 40292 E-mail the editor at: editor@louisville.edu Facebook: facebook.com/ UniversityofLouisville Letters may be edited for length and clarity, and must include author's name and contact information for veriﬁcation purposes.